I jumped into a lot of comics subscriptions this Spring. 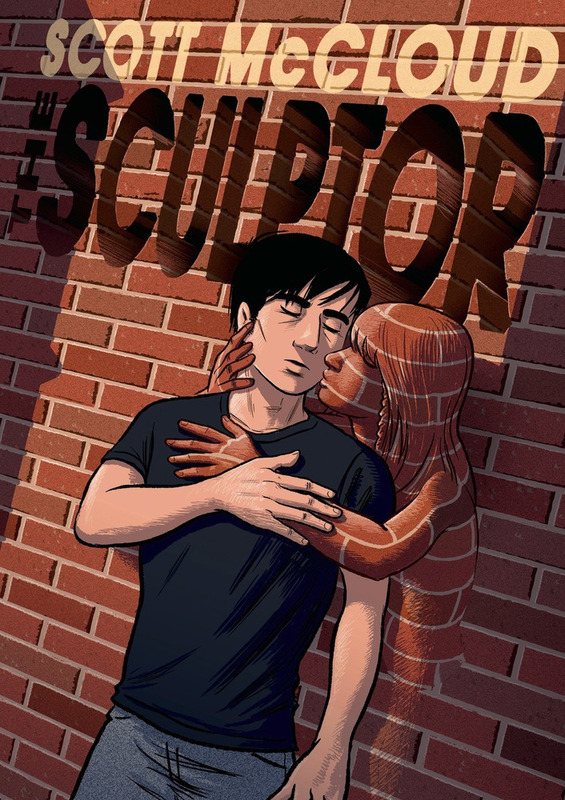 I wanted to get an idea of the current small press landscape, I wanted to push my own boundaries as a reader, and I wanted to read work from people I hadn’t seen before. One of those subscriptions is Yeah Dude Comics 2014 subscription from publisher Pat Aulisio, which has been a bit of a mixed bag for me. Certain work from the subscription like the comics of Laura Knetzger have been wonderful, while others have been less interesting. Box Brown’s New Physics is the latest book from the run. 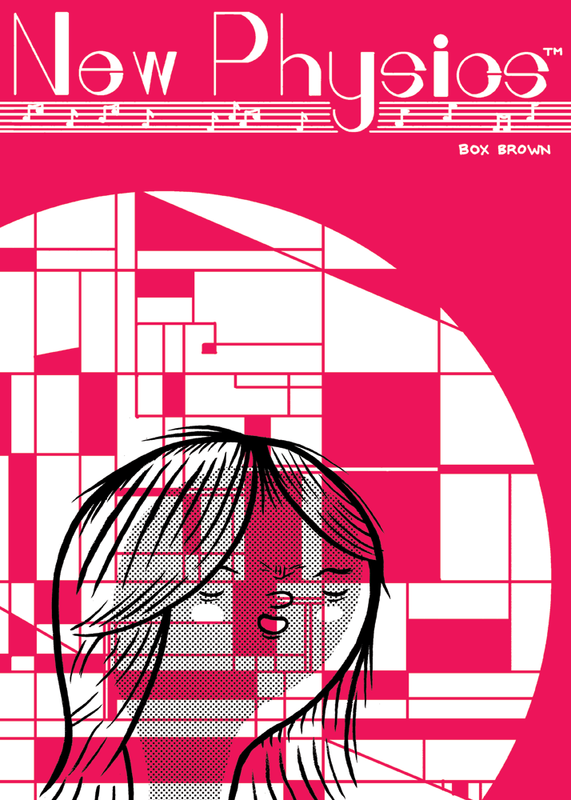 New Physics is 20 pages of two-color risoprint comics in neon pink and black. 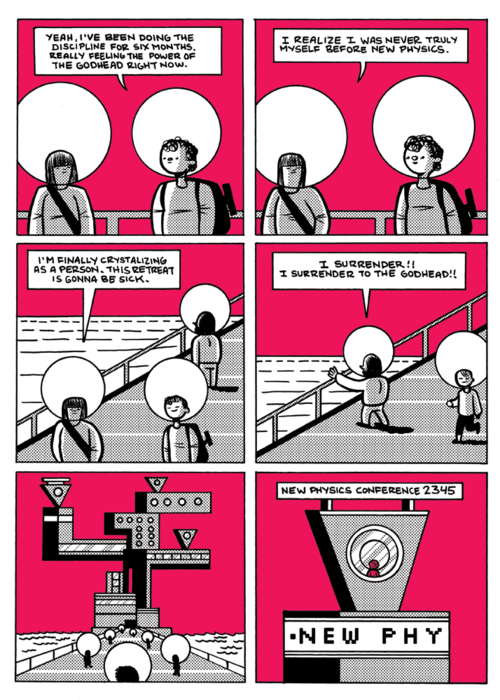 2014 is the year of the neon pink risograph comic, it seems. 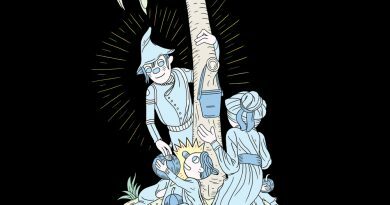 The comic is the story of Vern, a musician and social media mogul in the far future who slowly builds an audience and then converts it into a cult. One of New Physics’ strengths is Brown’s strong eye for page construction and paneling. Vern’s profile links up to the social helmets of new followers in one page. 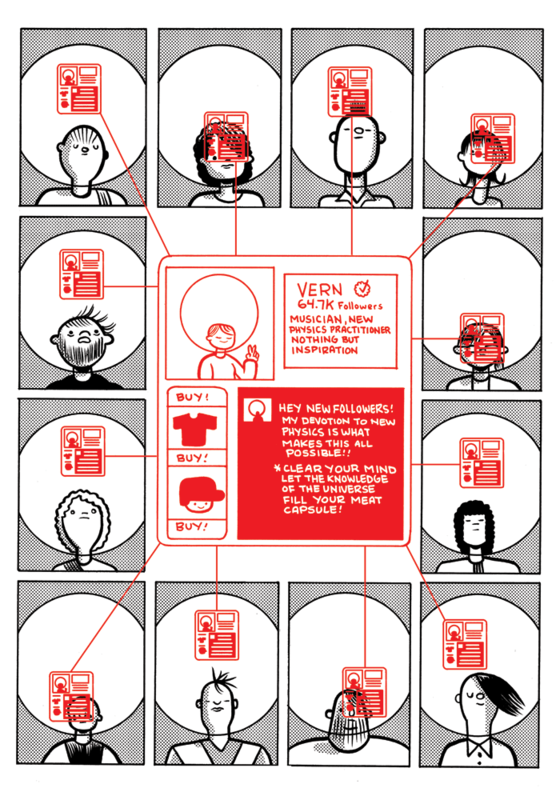 Other pages show websites and social media sharing; part of the comic is Vern’s personal journey, and the other part is the broadcast. Brown is able to tie all of this stuff up very cleanly. We also get a look at social media through a different lens – Brown imagines how the already social connectivity we live in now will evolve over a few hundred years. It’s not insanity to think that religions could spring up inside social media. Different platforms tend to pull specific crowds of people into them, forming like-minded collectives. It’s a fascinating rabbit hole. Brown also gets to have a little fun with his instagram-like follower pictures and usernames. I love the parallels that Brown draws between the New Physics cult and the non-denominational mega churches that collect thousands upon thousands of parishioners and put ATMs in the back of the sanctuary. There’s this theme of monetization that runs through parts of the comic – buy the NewPhysics™ Torso Reimaginer, get the hat and T-shirt. Buy your salvation, fools. New Physics is compelling and cynical view of tomorrow from a cartoonist you should be paying attention to. Recommended. Notes: Again, apologies from pulling images off the internet for this review – my scanner can’t handle neon colors very well, they all end up washed out. Because of this, there are some color discrepancies between the images as posted and the final comic d/t the riso print. Box Brown (tumblr: boxbrowncomics) is cartoonist and publisher with Retrofit Comics (tumblr: retrofitcomics) His recent graphic novel, Andre the Giant: Life and Legend, a biography of the legendary wrestler, was published by firstsecondbooks. You can get a copy of New Physics at Box’s website. New Physics is published by Pat Aulisio (tumblr: yeahdudecomics). You can see more of the comics published by Pat on his website.